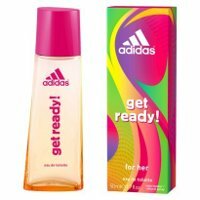 Adidas has launched Get Ready, a new duo of limited edition sport fragrances inspired by Brazil. Get Ready for Him and Get Ready for Her were developed by perfumer Jacques Huclier. Get Ready for Him ~ "Wild, spontaneous, passionate. adidas get ready! for Him captures the essence of Brazil with a tropical fusion of fresh, juicy fruit contrasted with sensual woods." With green mandarin, pineapple, ocean breeze, exotic fruits, clary sage, lavender, cedar, sandalwood and patchouli. In 50 ml Eau de Toilette and matching grooming products. Get Ready for Her ~ "Wild, spontaneous, passionate. adidas get ready! for Her captures the essence of Brazil with colorful fruity notes enhanced by an exotic floral signature." With watermelon, grenadine, orange, water lily, sugar, musk, cedar and amber. In 30 and 50 ml Eau de Toilette and matching bath & body products. Ack! Those boxes and bottles just yell “See you at Marshall’s!” to me! So cheap-feeling! Well, they’re pretty darned cheap to begin with, so at least for that! Target has them for a little over $10. Ha…there must be one, but don’t know what it is! But hey trust me adidas has a couple of really good things in this line… I still miss the Urban Spice cologne I used for everyday office wear. And the “Ice” line they had was good too. This one sounds, by the notes, like fruit punch from hell…. will let you know if I smell them! Perfect! And I’ve heard some of them are good. Never even seen one! That first one looks like a mouthwash bottle to me. Glad it’s a spray bottle and not a splash, or else there would be some sleepy dudes accidentally pouring cologne into their mouths in the morning! That’s the bottle shape Adidas uses for all their men’s colognes now, & agree, looks overly functional. Yes! Squeeze the cap on each side and turn to reveal the dosing cup! I just got the Get ready! For her Love it!!! smells so fruity also very cheap. totally worth it.